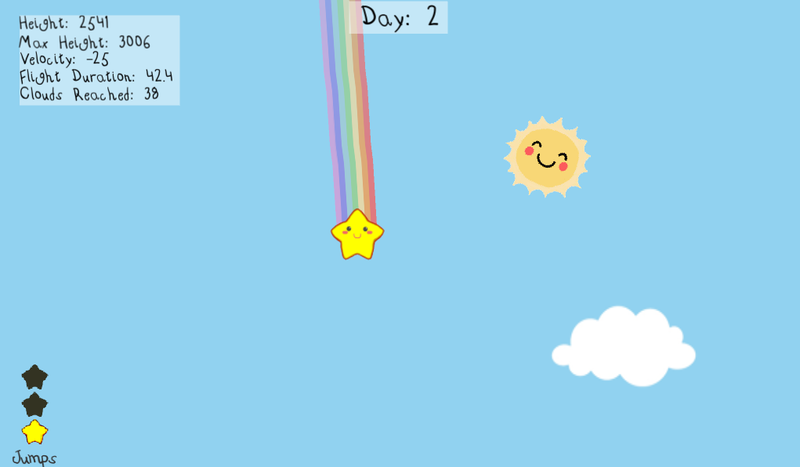 A fallen star named Sammy needs your help to get back to his friends in the skies! 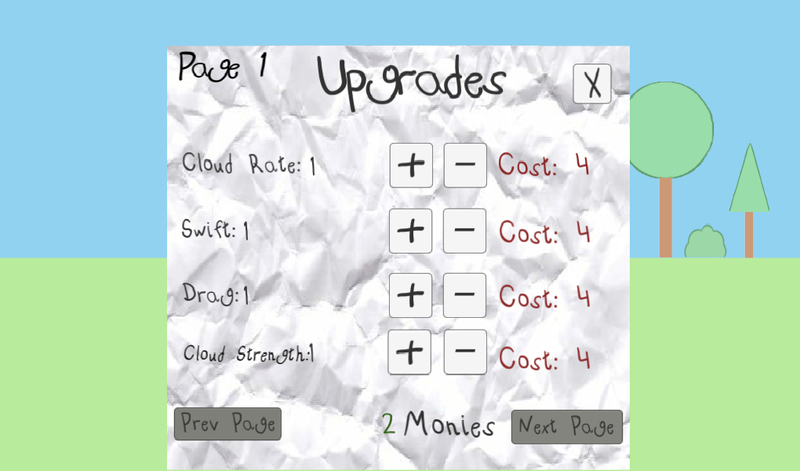 Use upgrades and skill to help him re-unite with his pals! Sammy the star has fallen out of skies! Worry not though, because he is able to jump on clouds, and with each passing day he grows a little bit stronger! Use the clouds to propel him back up into the sky so he can be the star he is! Designed with handheld devices in mind. Highscores to compete with friends! If using a PC, all you need is a mouse to click and drag Sammy around! If using an Mobile device, touch is all that is required. Start the game by launching Sammy into the air by using the mouse to drag him down and release. Once in the air use your mouse to direct where he goes next. Hey all, thanks a bunch for taking the time to check out my submission. So, to begin with, just wow. Can't believe I finished this in time. When I first started the game I just wanted something that was family friendly, and casual enough for anyone to pick up, yet intuitive enough to where someone who want's to "be the best" and min-max to the extreme can both be catered to. See as this was my FIRST PROJECT EVER it's been such an AMAZING experience. I'm not here for the prize money, I'm just here to put smiles on faces. Attached to the download there's both an EXE and APK file. If you want to, go ahead and copy that APK file and give it to friends, that's what it's there for :) Down the road I plan to release this on the google playstore and appstore, so be sure to keep an eye out for that in the near future as well! Much love and respect to you all, and I hope you all enjoy my game! When you start Star Ascent, Sammy is small, unable to jump very high, and relatively slow. As you progress and grow throughout the game you see Sammy grow into the star he was meant to be! Help him to get become stronger so he can be reunited with friends! Music provided by: Kevin Mcleod - "It came upon a Midnight Clear"
Check us out it would mean alot!